Do you want to turn your site into a money-making machine? Rhetorical question – of course you do. Chances are, you follow the same successful formula as most of us. You create engaging content to attract visitors. Then, you turn those visitors into leads and send them down the sales journey. You make money from the customers who actually buy your products. It’s a good system, that’s why everyone uses it. But it’s not the only way to make money. You can also promote affiliates and get paid for it. If you do well, you can make a lot of money from it. And we want to see you make money, which is why we’re sharing 29 of our favorite affiliate marketing tools with you. But first, let’s cover the basics. Is Affiliate Marketing Easy Money? If easy means “money for nothing,” then no. Forget all those stories you hear about how easy affiliate marketing is. Or how you can make money without doing anything at all. But in terms of difficulty, building an affiliate campaign isn’t that hard. It requires work. Affiliate marketing is like any other marketing campaign. You have to conduct research, create content, and capture leads. To be successful, you must build a marketing strategy around your affiliate campaign. Now for the good news. The affiliate marketing tools listed here will help you build that strategy. Of course, you’ll still have to spend time researching and creating content. But these 29 tools will help you build a successful campaign from the ground up. Now that we got that out of the way, let’s jump right in. Ready to beef up your email list but don’t know how to start? Dive right in with OptinMonster. Geo-Location Targeting: Create custom optins that target visitors based on their location. Exit-Intent Technology®: Automatically engage customers the second before they leave the page. Campaign Scheduling: Choose the start and end time of your lead generation campaign. Great for seasonal promotions. As you can see, OptinMonster is way more than an email marketing tool. It’s a fully-functional lead generation platform that works with popular email marketing tools. But how does this boost affiliate marketing, you ask? Simple. Use it with your favorite email marketing platform to grow your mailing list. From there, you can start promoting your affiliates in your newsletters. More subscribers mean more leads and more potential money for you. Tired of the usual email marketing platforms? Want something that makes receiving emails fun for your readers? Then check out CakeMail. It’s an effective email tool that’ll knock the socks off your affiliate campaign. CakeMail might look like a regular old email tool, but there’s more to it than meets the eye. Other email tools also make newsletters easy, but CakeMail lets you make actual eye candy. Hence the name! Try its easy-to-use templates to build professional, beautifully crafted emails in minutes. Plus, it comes with cool tools like A/B testing, segmentation, and a Google Analytics add-on. What does this mean for affiliate marketing? Well, you get tools for growing subscriber lists and creating attractive emails. Attractive emails makes better affiliate content, and better content converts. Constant Contact is an email marketing tool that’s both powerful and beginner-friendly. Also, Constant Contact is one of the most popular mailing platforms around. So it’s no surprise it integrates with many eCommerce tools – including OptinMonster. Plus, it has a wide range of mailing templates. So, you’ve got a lot to work with when crafting affiliate newsletters. Looking for an easy, cost-effective email marketing tool to enhance your affiliate campaign? Try MailChimp. It’s free up to 2,000 subscribers, so play around and get used to it. And when it’s time to scale, upgrade to one of its premium solutions. Plus, you can combine MailChimp with OptinMonster and bulk up your mailing list. Then you’re ready to craft affiliate-driven newsletters. Here at OptinMonster, we believe in the value of convenience and accessibility. Because something’s powerful doesn’t mean it has to be complicated. This is why we love using MonsterInsights in all our marketing campaigns. MonsterInsights is a WordPress plugin for tracking site performance. But that’s not all. It also presents complicated Google Analytics data in a digestible, easy-to-understand manner. Try using it to measure the performance of your affiliate campaign. 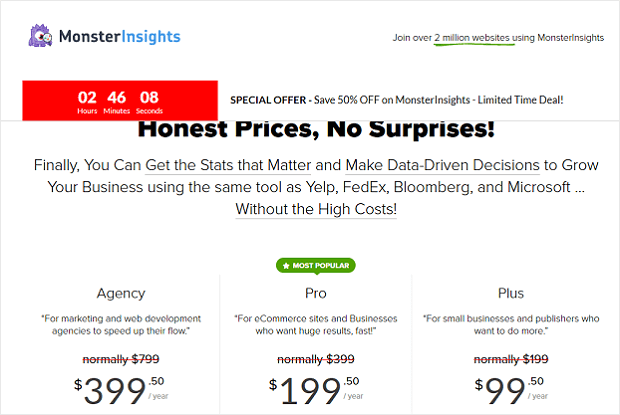 MonsterInsights gives you everything you need to overhaul your marketing strategy. Go check it out. You’ll be surprised at how easy it is to use. Looking for a collection of powerful affiliate marketing tracking tools? Then you might want to check out Everflow. All post-conversion activities in your affiliate campaign. Use this data to tweak your ongoing affiliate marketing strategy, or build a new one from scratch. Either way, Everflow gives you the tools to turn affiliate links into steady income. CAKE has a range of great marketing tools for boosting site performance. One of those tools is Journey, an awesome tracking tool for measuring affiliates. Journey puts you in the affiliate marketing driver’s seat. Its analytics tools help you make data-driven decisions around your affiliate campaign. That way, you get actionable info that improves your affiliate content. A good landing page can do wonders for your conversion rates. However, the importance of landing pages may be common knowledge, how to create them isn’t. Not everyone is an amazing web designer oozing creativity. But thanks to Instapage, that’s okay. Instapage is a drag and drop builder that lets anyone create awesome landing pages. But Instapage is more than that. It’s actually one of the best affiliate marketing resources in your toolbox. That’s because Instapage comes with features like A/B testing and heatmaps. That way, you can roll out finely-tuned pages that promote your affiliates. Flippa isn’t your traditional page building tool – you can’t even build pages with it. So, why is it even ranked on our list of top affiliate marketing tools? Because it’s one of the easiest ways to get an affiliate marketing website, hands down. With Flippa, you skip all the blood, sweat, and tears that go into building a top-performing website. Instead, you buy a ready-made one in your niche that’s already built and optimized for SEO. The framework for organic traffic has already been laid out. All you have to do is promote your affiliate’s content and you’re good to go. Pretty Links is incredibly easy to use and turns your long affiliate links into something readable and easy to remember. And shorter links really do make bigger impressions. 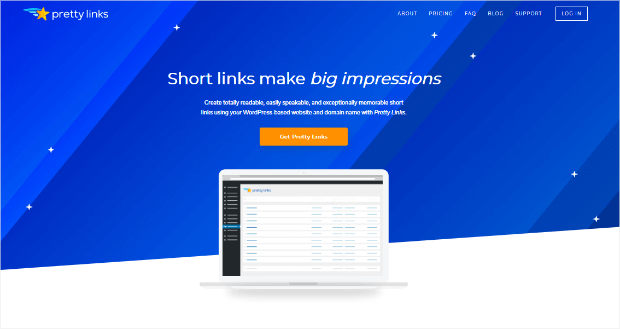 In addition to giving you better affiliate links, Pretty Links also gives you an easier way to manage server-side redirects, brand and advertise your links, monitor your links’ activity. There’s also a cloaking feature so you can use affiliate links in your email marketing campaign or in your OptinMonster popups to boost affiliate income while developing relationships with your visitors. With Affiliate Royale you can develop and implement an affiliate marketing plan from start to finish in no time. Affiliate Royale comes with a suite of powerful affiliate link tracking tools that monitor the performance of your campaign. Clicks, payments, and sales can all be viewed on an easy-to-understand dashboard, which can be personalized to include the data important to you based on your affiliate marketing goals. If you’re running your website on WordPress, ThirstyAffiliates is a must. Not a traffic tool in the traditional sense, ThirstyAffiliates does improve affiliate traffic. It does this through “link cloaking.” That’s a fancy word for turning long, ugly links into something less overwhelming. And you want your links smaller, because prettier links are easy to remember and even easier to share. AdSanity is a nifty WordPress plugin that gives you control over your advertisements. You can use it to create ads for affiliate products and display them on your site. What’s more, AdSanity also lets you automate ads, so they’re displayed as specific times. Also, its traffic tools simplify the tracking process. That way, you know who’s viewing and clicking your advertisements. AffTrack is a collection of affiliate marketing tools for growing your affiliate network. You can use them to improve traffic and conversions, as well as manage your affiliates. It even lets you tune your campaign based on your visitors’ devices, language, and country. 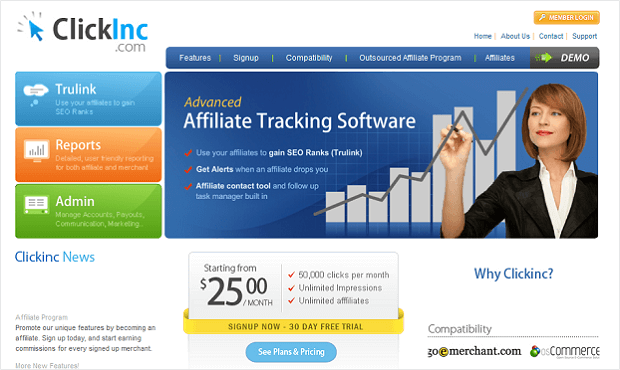 ClickInc is an affordable affiliate marketing tool for tracking traffic and performance. It’s great for boosting SEO and sending organic traffic to your affiliate content. Plus, its alerts you of any changes to your campaign, like when an affiliate drops you. There’s no such thing as failure, only learning experiences. It sounds cliche, but it’s true. Mistakes teach us what not to do. So, why not use your competitors’ mistakes to improve your marketing strategy? With SEMRush, you can. Where competitors spend money on advertisements. Ways you can tweak your affiliate marketing campaign. Find and target potential competitors and customers. Identify patterns in your industry. What’s trending and what’s yesterday’s news? See where we’re going with this? SEMRush is like a marketing Swiss Army knife. It has everything for building SEO-driven content that drives your affiliate marketing campaign. Research new content used by top-performing brands. Naturally, you want to strengthen your affiliate campaign. Well, you’ll be excited to know Ahrefs’ “Content Explorer” lets you do that. Use it to find other brands in your industry, and see if they want to become affiliates. Have a hard time finding the right keywords for your content? Then add LongTailPro to your collection of affiliate marketing tools. If you’ve been in eCommerce for a while, you can probably guess what LongTailPro does by looking at its name. It’s a tool for finding keywords for your web content. More specifically, longer keywords that are easier to top Google’s first page with. Better keywords deliver better traffic. More visitors interested in your content will land on your website. And if your affiliate links and keywords align, that’s more opportunities to convert. Everyone’s happy. Expand your influence on Twitter. Build relationships with industry professionals. Commun.it makes it easy to build a Twitter community around your brand. And once you build your community, you can start sharing affiliate content with them. Add Social Searcher to the list of must-have affiliate marketing tools. Why? Because it lets you track conversations across all popular social media channels. You can use it to see what people are saying about your brand, product, or industry. What’s more, Social Searcher makes it easier to come up with engaging social media content. You get a sense for what topics, hashtags, and memes are popular for specific platforms. You can use that information to create high-converting affiliate content. There’s an unwritten law about Hootsuite. You have to mention it when listing social media tools. Why? Because Hootsuite is a favorite, and it’s been around for a while. Plus, it works with all popular social networking sites. Give it a try. Hootsuite offers a free version you can use to launch your first affiliate campaign. And when you need to grow, upgrade to one of their premium solutions anytime. Tipalti is arguably one of the best affiliate marketing tools you’ll ever come across. Because Tipalti manages how affiliates are paid. And if you’re paying people to market your product, that’s very important. But that’s only the half of it. Tipalti also has competitive fees. That makes it a favorable alternative to PayPal and other payment platforms. Moreover, Tipalti simplifies international payments, so everyone gets paid on time. And we all know how important that is. Best of all, Tipalti automates the entire payment process. This means you can spend more time on what really matters – coming up with killer content. LinkTrust is an all-in-one marketing platform for managing affiliate campaigns. It’s designed to give you total control over your affiliates. You can use it to track impressions, leads, and conversions, as well as manage payouts. Basically, LinkTrust does it all and is easily one of your top 5 affiliate marketing tools. Want to enjoy all your favorite affiliate program tools without cycling between platforms? Then HitPath is the perfect tool for you. HitPath is a powerful tracking platform for monitoring affiliate campaigns across multiple channels. Use it to track data on your eCommerce site and social media platforms from one location. But to call HitPath a tracking tool would be doing the program a great disservice. Send direct messages to affiliates. Create and send affiliate newsletters. It even has a built-in content management system (CMS). That’s useful for fleshing out your affiliate campaign. Impact is a comprehensive marketing platform. With it, you get 4 affiliate marketing tools for researching and managing partnerships. It’s great for scouting and connecting with affiliates that align with your brand. But that’s not all! Impact also tracks campaign performance and lets you manage your affiliate relationships. That way, you can build the perfect marketing campaign that works for you, on your terms. Beginners, take note. WordPress is, without a doubt, the easiest way to establish your online presence. WordPress powers roughly 30% of the internet for a reason – it’s powerful and easy to use. With all the great eCommerce plugins available, sharing affiliate content is a breeze. Want to learn more? 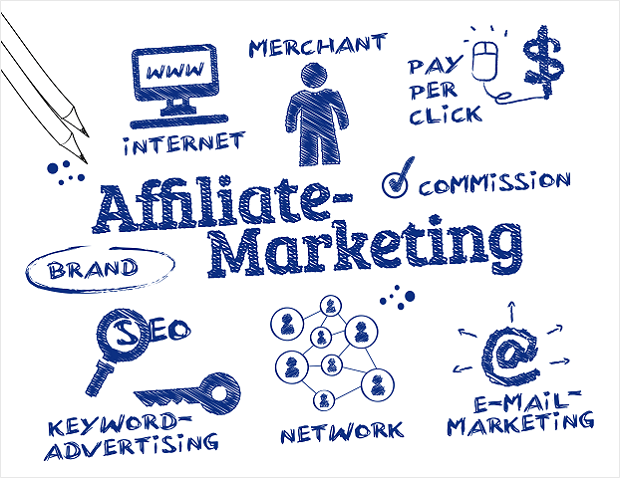 Take a look at this beginner’s guide to affiliate marketing by our friends at WPBeginner. Snazzy images are the bread and butter of any successful affiliate marketing campaign. Unfortunately, some companies skip on visuals. Usually, because they don’t have a graphic designer on the team. But with Canva, you don’t need one. Canva lets you create awesome, attention-grabbing pictures for your content. Use it to create banners and other exciting imagery for your affiliate campaign. Lumen5 uses stunning shorts to capture your reader’s attention. It’s like Canva, but with videos. Want to hear something really cool? Lumen5 uses artificial intelligence to perfect your videos. What a great way to improve conversions in your affiliate campaign. Aren’t infographics cool? They’re fun, quirky, and great for helping readers understand complex information. With Easelly, you can use the power of infographics to liven up your affiliate content. Explain challenging concepts or give relatable diagrams using one of its ready-made templates. And don’t be surprised if you see one of your pictures shared on social media. Everyone loves a good infographic, after all. Ready to roll out your affiliate marketing campaign? Heck yeah you are. And the tools on this list will help you build an affiliate campaign that works for you. And if you really want to take your marketing strategy to new heights, try OptinMonster today. Case Study: See How Top 6 Digital Increased Affiliate Revenue 30% Using Exit-Intent®!